DeptNo – This variable Stores the Department Number. 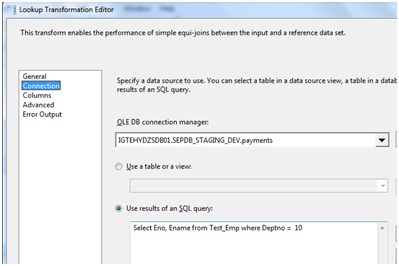 Query – This variable stores the Query Statement that is used as SQL Command for the Dynamic Lookup. Enter the value for DeptNo package variable as 10 and for Query package variable goto the properties by pressing F4. 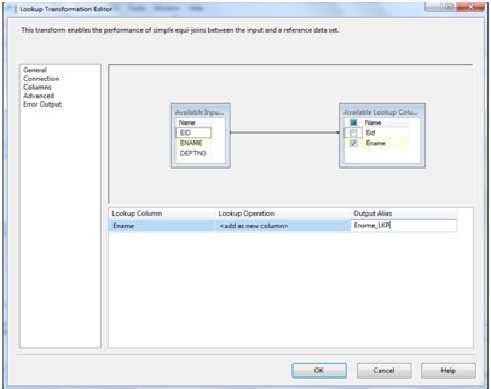 Drag and drop the Data Flow Task from Control Flow Items in the Toolbox to Control Flow tab. 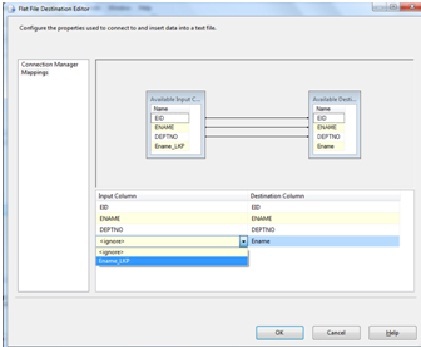 Click on New button for creating the new connection to the SQL Server to connect to the database where the table is created and click on Test Connection to verify whether the connection is successful or not. 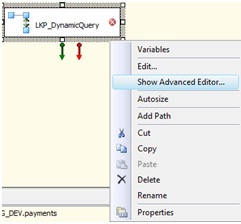 In the columns page check which columns are required as source and click on OK button. 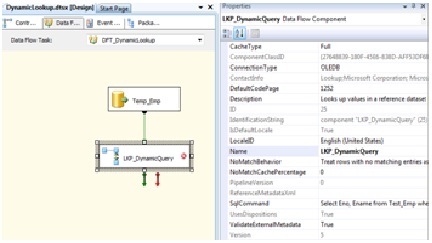 Drag and drop the Lookup Transformation (named as LKP_DynamicQuery) from Data Flow Transformations in the toolbox to the Data Flow tab and connect the lookup to the OLEDB Source task that is already in the Data Flow tab. Go to the Expressions property and click on Ellipse (…) button. 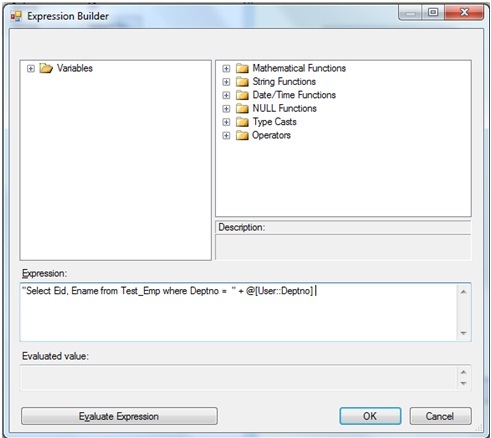 From the Variables tree select the user variable Query in Expression Builder dialogue box, drag and drop the Query package variable in the Expression text field and click on Evaluate Expression for verification and click on OK button. Click on OK button in the Property Expression Editor dialogue box. 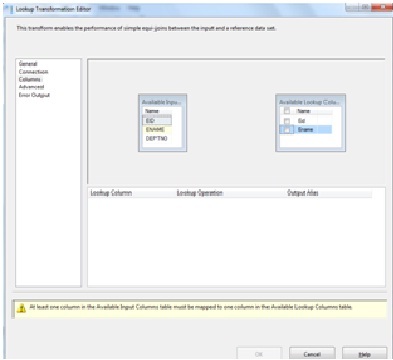 Go to Menu bar –> select Build –> select Build SSIS Excercises (Here SSIS Excercises is my solution name. In the above figure we can also see the properties of the Lookup which has SqlCommand property as empty value. Right click on the Lookup and select Show Advanced Editor for giving the connection to the database. 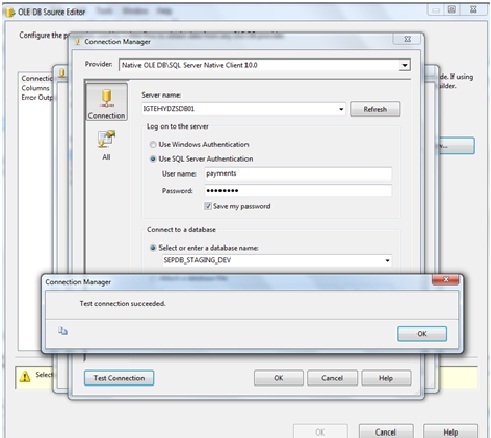 Select the Connection to the SQL Server from Connection Manager and Click on OK button. Open the Lookup Task and in the General page select “Redirect rows to error output” from “Specify how to handle rows with no matching entries. 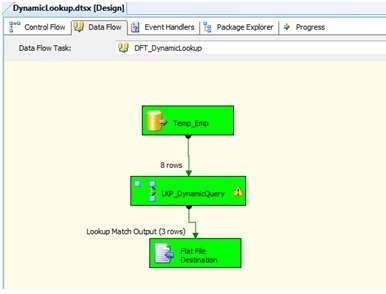 Drag and Drop the Flat File Destination from the Data Flow Destinations in the toolbox and link it with Lookup Task with Output as Lookup Match Output and click on OK button. 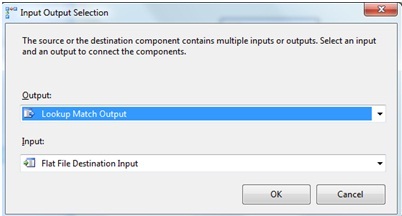 Double click on Flat File Destination Task and click on New for assigning the new connection to send the matched rows from the Lookup. Click on New button to create new connection for the destination of the flat file. 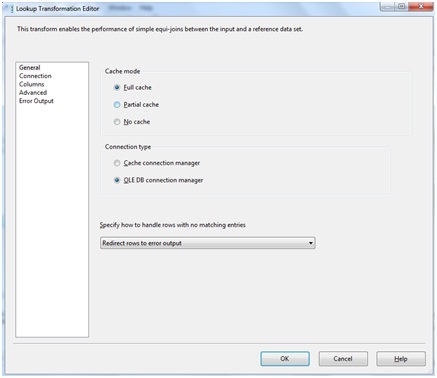 Select the type of Format in the Flat File Format window. Here, we are selecting as Ragged Right and click on OK button. 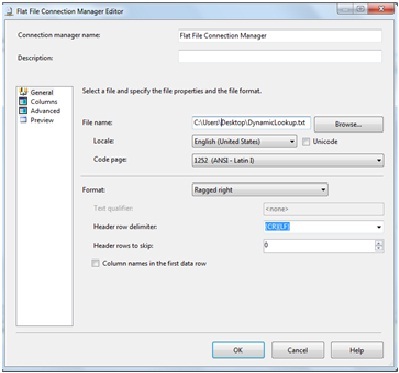 Click on Browse button in the Flat File Connection Manager to enter the path of the file and filename that stores the data from the lookup. Goto each and every page and verify the columns and at last click on OK button. Go to the Mappings page in the Flat File Destination editor and select the Ename_LKP for selecting the ename that are matched in the Lookup and click on OK button. Save and execute the package by pressing F5. Now we can see the package is executed successfully. If we open the Flat file that was created we can see as follows. Hope this will be helpful…. The Post was really good. till now i do not know how to use lookup transformation with variables. so really wonder way and easy way to learn lookup with variables. based on this we can try some other examples. hope you will post like this always. n finally blog was too small. please enlarge and do. Great, this is what I was actually looking for. Thanks for sharing this. One question, it work if Lookup connection is a OLEDB For Oracle type ? Many thanks for this excellent solution. This should definitely be more publicised. I never thought to look there, ever. Thanks! Weird that the development team decided to hide the option in such a location. Thanks for the information..
Ingenuious. Thank you very much. This is teriffic. This post really solved big issues for me. Especially after reading on so many other places on the net that it isn’t possible to accomplish dynamic configurations of the Lookup component.